The school year is quickly coming to an end here in New York. While I’m looking forward to spending more time with my boys, they’re looking forward to karate camp and sleepovers at their friends houses. Just like during the school year, I always make sure that everything my boys leave the house with comes back with them at the end of the day – and the way I make sure that happens is by using Stuck On You labels on everything from their water bottles to their clothing. When I was first introduced to Stuck On You, I was instantly impressed with the quality of their labels and products. They are the only brand I’ve used that have stood the test of time – these labels work! Working in a preschool, I see so much stuff go unclaimed in the lost and found bins. Parents can’t remember which hat is their kids, the kids can’t remember what pair of gloves are theirs – the bin becomes a mountain by the year end. Both of my boys are typical young kids – they take off their gloves without worrying where they put them, they leave their lunch boxes behind when they’re done with snack, and they peel off their jackets and toss them into the closest pile! But because they’re labeled, they always make their way home. I’ve used other brands of labels that lose their stick, but you don’t have to worry about that happening with Stuck On You labels. Stuck On You sent me a set of their Write On Labels ($9.99) and their Iron On Write On Labels ($12.95) for review. 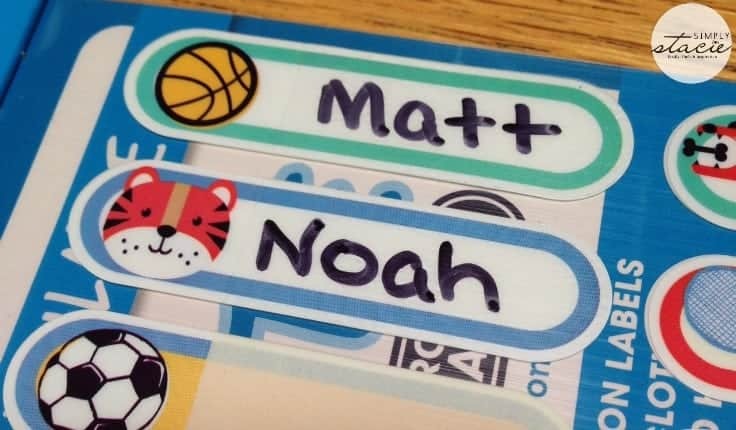 These are great labels to have on hand for any situation that comes up this summer – whether it’s to label your child’s sleeping bag for a party, or a lunchbox for day camp. The Write On Labels are waterproof, microwave and dishwasher safe. 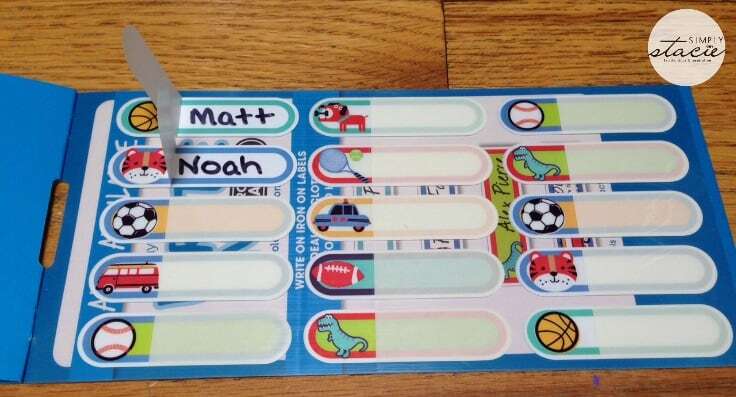 I simply peeled back the protective top layer of each label, wrote in my boys names, resealed them and was ready to go! Go ahead and order a few packs to have on hand – you never know when you’ll need to label your stuff! 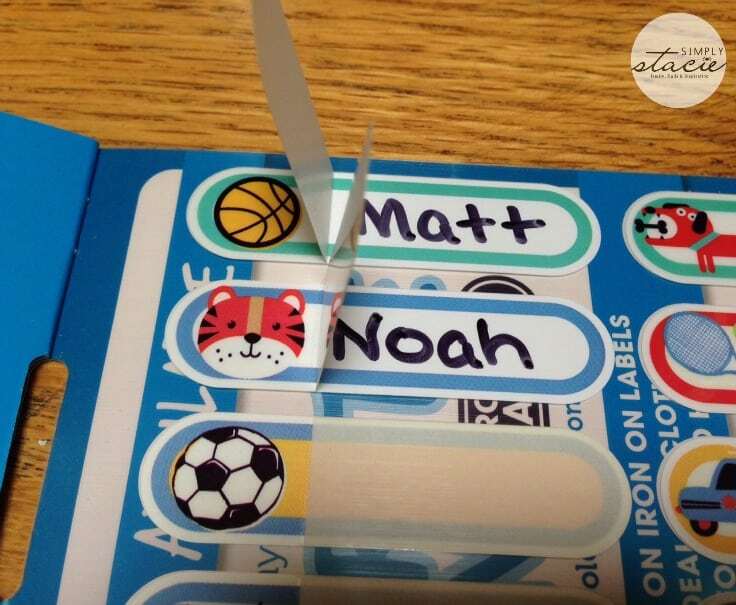 The Iron On Write On Labels are simple to use as well. All you do is write, peel and iron. These are great for clothes that will be laying around at camp when they come off and bathing suits go on. I promise you won’t be disappointed with any product from Stuck On You – they’ve got a fan for life in me for sure! Stuck on You was created in 1995 by a mom who had an idea for a business that would let her stay home with her new baby, and whose oldest son needed labels for daycare. Now, 20 years later, Stuck on You offers a huge range of personalized labels and gifts and sells to hundreds of countries over the world. 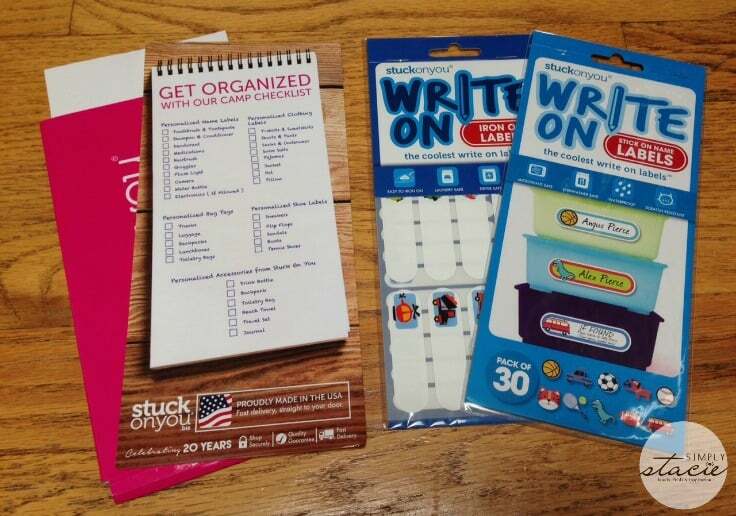 Whether you need labels for school supplies, camp essentials, backpacks for travel, or you’re just looking for cute personalized gift ideas, Stuck On You has you covered. You can see all that they have to offer on their website. I like the junior backpack! I like the junior backpack. My niece would love this. I would get my son and daughter’s names in a wooden Puzzle made. My favorite product is the Kid’s Drink Bottle. I’d like the Monogram notepads for the office! I like junior backpack and KIDS DESIGNER SPORTS LABELS. My favorite thing is the iron on clothing labels. I love the sports value pack! I like the personalized backpacks. I love the luxury towels! I love the water bottles! I love the skinny pencil labels…they fit everything! I like the sports value pack. I like the Lunch Pail. I like the Kids Designer Value Pack. The tiger pictures are adorable! I like the monogram notepads from Stuck on You. I like the FACEWASHER and the LUNCH PAIL. I like the luxury towels. i love the Junior Backpack! I loooove the luxury towels in stone!!! I like the long pj bottoms. I like the Truck print JUNIOR MESSENGER BAG. I absolutely adore the art smock! I really like the Beach Towel! The Penny Scallan Button Bag Tags with the little Russian doll is super cute. I like the Party Cupcake Toppers. I love the lunch boxes and lunch pails.